First of all, you should NOT call ttsabort; in the catch statement. An exception aborts te transaction unconditionally, so your ttabort; has no matching ttsbegin; in this case. and http://msdn.microsoft.com/en-us/library/aa893385.aspx, especially the section “Exceptions Inside Transactions”. Thanks Tomaz for your advice and links also, it is very useful and it should be applied. 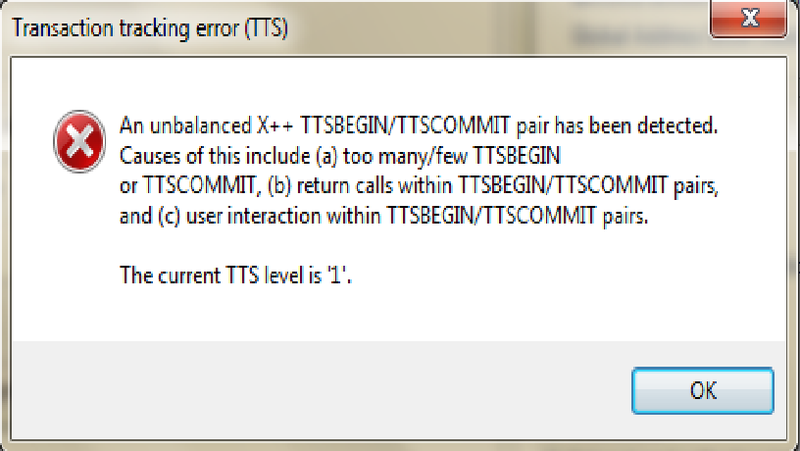 Your error is caused by unbalanced ttsgein; / ttscommit; pairs. This most often happens when your try to show a form from within a uncommitted transaction, what is not possible in AX. I would suggest you use a standard try..catch blok, where you catch the exceptions and use throw error command. This will result that all tts levels will be reset and the update is rolled back. The suggested solution is not good in a production environment.